9/2/12 - Restitution - Milan, Pinacoteca di Brera - Between March and June 1942, the painting collection owned by Federico Gentili di Giuseppe, who had passed away in 1940, was dispersed at auction in Paris against the wishes of his family which had fled the Nazi persecutions. The documents from these auctions provide exact records of the looted paintings and the Louvre, notably, was sentenced in 1999 to return five works it held on deposit as part of the MNR. Other works from the collection have since been recovered by their legitimate owners . For the past twelve years, the heirs had demanded the restitution of two paintings from the Pinacoteca di Brera, but to no avail : one by Bernardo Zenale and another more important one, Christ Carrying the Cross by Girolamo Romanino. Having learned that the second canvas had been lent for an exhibition to the Mary Brogan Museum of Art and Science in Tallahassee, Florida and that none of the formalities needed to prevent seizure had been carried out, the family lawyer, Corinne Hershkovitch, contacted the American authorities providing proof that the work belonged to the Gentili di Giuseppe collection. Federal agents then proceeded to seize the painting which will be returned to the heirs. The work had been acquired in 1998 by the Brera although its history and former ownership by Federico Gentili di Giuseppe had been perfectly established. This is a masterpiece by an artist from Brescia whose manner is at the crossroads between two schools, Lombard and Venetian . 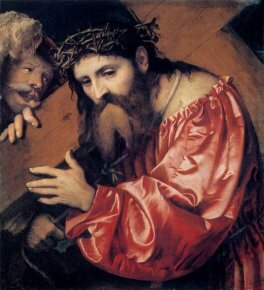 Christ Carrying the Cross, with the remarkable fabric of the tunic, clearly evokes Titian to whom Romanino is often compared, at times overly so. Regrettably, Italy, always ready to call for the return of its national treasures from foreign museums, particularly American ones, in a totally justified way, systematically refuses the restitution of Jewish works looted during the war by invoking a law prohibiting the practice. However, there is nothing to prevent said law from being changed. For more information about this case, see notably : Corinne Hershkovitch and Didier Rykner, La Restitution des œuvres d’art. Solutions et impasses, Hazan, 2011, pp. 54-56. On Romanino, see the review on the 2006 retrospective on the French site.